Ultra-colorful and fun, this polished bohemian look is full of global flavor! 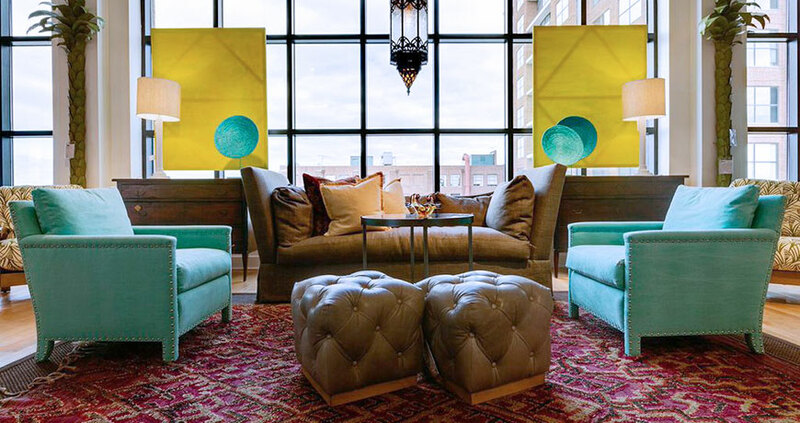 While bold turquoise and playful yellow pops make flirty appearances throughout the upholstery and accessories, the neutral sofa and traditionally tufted leather ottomans act to both anchor the space and keep it sophisticated in tone. Re-create a similar space of your own with this polished bohemian style by selecting two or three bold colors that not only pop individually, but accentuate each other and mesh with the neutral base tones nearby. Bring in bold patterns, and don’t be afraid to mix and layer! A handful of textiles in various patterns, colors, textures and sizes can truly bring a space to life, so long as they don’t overwhelm the space in their abundance. Shop the product picks featured in this space, along with some of our inspired product picks, to create your own polished bohemian look!